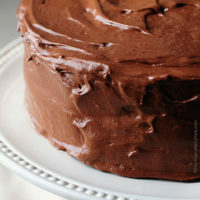 This classic Yellow Butter Cake with Malted Chocolate Buttercream Frosting will make any celebration that much sweeter. My kids have one more month of school left. One more month or rushing out the door to avoid a tardy. One more month of tests and homework. One more month of peanut butter and jelly sandwiches every day for lunch. So I made them a cake. I’m calling it the OMTG Cake. (That’s One Month to Go Cake, for those of you not up on your hip acronyms.) 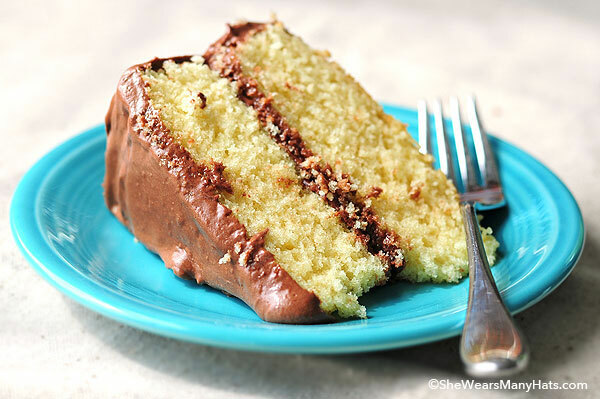 This is a basic yellow cake topped with a splendid chocolate malted buttercream frosting. 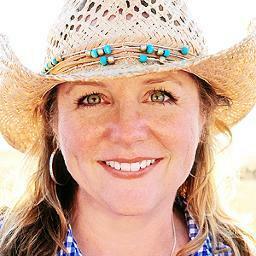 Malted Buttercream Chocolate Frosting? Surely that will help kids everywhere push through one more month of standing in single file? 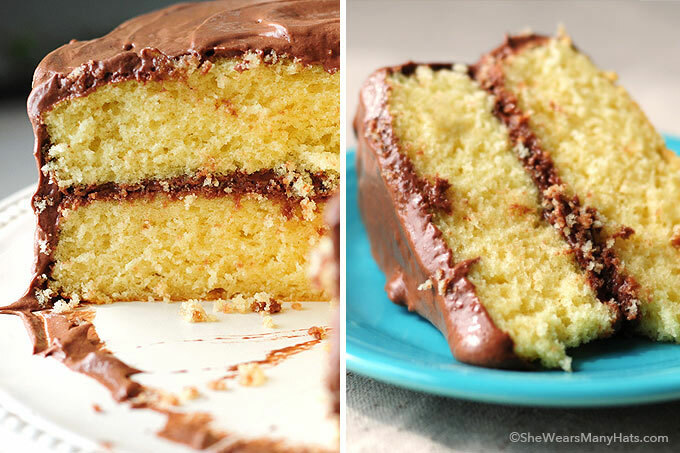 A delicious classic yellow cake with a malted chocolate buttercream frosting. In a mixing bowl, lightly whisk together first 4 ingredients; flour, sugar, baking powder, salt. Add butter and 3/4 cup milk to the mixture, and beat together until just combined. Stop to scrape sides down a couple of times. Do not over beat. In a separate bowl, lightly beat eggs, remaining milk and vanilla extract together. Gradually add to the flour/sugar/butter mixture, and mix until just combined. Again, do not over beat. Divide batter into two greased and parchment lined 9-inch round baking pans. Bake at 350-degrees F for 30-35 minutes, or until cake tester or toothpick comes out clean. Once cooled completely, frost with Malted Buttercream Chocolate Frosting. Frosting adapted from Southern Living March 2009. Ooo, you just made a classic cake even better with that frosting! Haven’t made a malted chocolate icing in years. Thanks for the recipe! We have one day to go here! ONE day! But this cake will make their month fly by! This looks… well… just delicious. I need this for breakfast. You’ve just added a wonderful twist to a classic yellow cake- looks great! I have a brillint chocolate cake in my recipe box but not a yellow one so I’m relly keen to give this one a go. I’ll let you know how I get on.. This is one of those classic cake flavor combinations that just never gets old… And your version looks even better! Bookmarking it right away… Can’t wait to try it! My mouth is just watering! 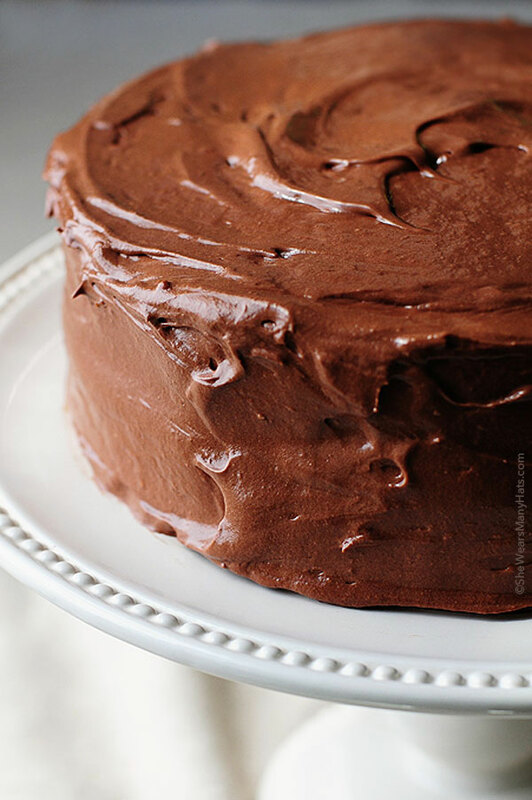 This cake looks amazingly moist and delicious, perfect! Well, I am a baker, until you get me around a cake. Then I pretty much forget all I know and everything just turns out horrible and dry. This one looks delicious, though…maybe I’ll give it a go this evening. I skipped breakfast. I clicked on your post. I am now tortured and my tummy is disturbing my co-worker. Just sayin’. Oh by the way YUM!! This looks fabulous and I love the idea of using malt in the frosting. Brilliant!! Wow, I feel like I can reach out and stick my finger in that frosting. I like the name of it too… totally unapologetic about the butter. That is one beautiful cake. Your kids are lucky to have a mom as great as you. So elegantly simple…I love it! I just got some malted milk powder so I’m very excited to try this. Is some of the buttercream recipe missing? OM2G Cake…..I love it. I’ll have to tell that to my kiddo and he’ll probably start “roffle-ing”….you know ROFLing….except he uses it like and ACTUAL word? Roffle-ing. Yummy! Must make for my two. They have 10 days left! Damn, that is one fine looking cake. And chocolate malted frosting? Heavenly. This is bake perfection. Looks amazing and I seriously want to eat it right off the screen right now. Oh I love the OM2G cake! 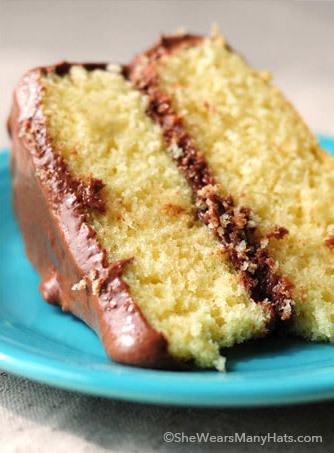 It’s so beautiful (yellow cake with chocolate frosting has always been my favorite). ps I bake with salted butter too. This looks amazing! I love yellow cake too, can’t wait to try this. 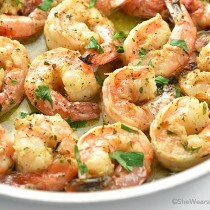 mmm looks so good yet so simple!! This looks like the perfect nostalgic vanilla birthday cake! I have never been too much a fan of chocolate cakes, but vanilla is my language! Will you be my mom and make me cakes with cool abbreviations? Surely my real mom won’t mind sharing. Amy, this is my hubby’s favorite kind of cake! That frosting look so creamy, I just want to stick my finger in it! this sure does look fantastic!!! loving the new design! What an amazingly simple dessert, that looks absolutely delicious! Wonderful pictures! Only 1 1/2 weeks of school left here! i love the sound of the malted frosting, its so beautiful and glossy. I think i need to track down some malt powder. Wow- we’re drooling… and what a beautiful picture! bravo! That frosting looks so lickable. OMG… yum!!! Oh man do I wish I had a slice of this cake! Absolutely gorgeous!!! You had me at chocolate malt. The cake looks absolutely delicious. I would love a piece right now. The cake looks perfectly moist!!! 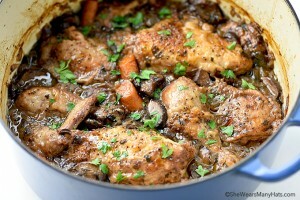 I just tried out this recipe, and let me just say- it surely does not disappoint. The cake is moist and delicious, and the malt icing is the perfect touch, it gives the layer of frosting in the middle a little ooey gooeyness :). The only thing I’d recommend is trying not to cut any corners with ingredient substitutions- whenever I try out a new recipe, I usually use smartbalance butter and splenda sugar to try to decrease the calories juuust a little and sometimes I can get away with it, but I think my cake would’ve tasted even better than it does (is that even possible? :)) if i had just used regular butter. Mine also only took 25 minutes to bake. My family is also big coconut fans, so I sprinkled a little coconut over the top of the frosting and they were absolutely in heaven! Thanks for the great recipe, I’ll definitely be making this cake again! you know me and the making of cake don’t necessarily play well together, right??? but at the moment i really would like a piece of this . . . with coffee please . . . thank you . . .
going to try it with some ice cream. 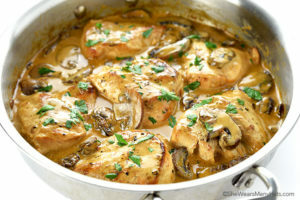 I have had this recipe ‘pinned’ for like a year now–I’m finally making it for my best friend’s birthday today! 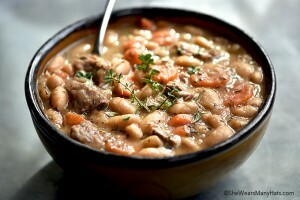 Thanks for the recipe and the photos are beautiful! This is a WONDERFUL recipe. I made one-half of the recipe into cupcakes. One-half batch yields approximately 2 cups of cake batter (12 cupcakes). The cake was moist and lofty. The cupcakes had a slight dome and did not stick to the pan at all. I’ve tried over 40 vanilla/white cake recipes over the last 4 years, and I just love this one!!! I hope others try it, the recipe is a true keeper. Food is such a gift from God. 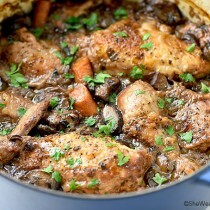 I am going to need to make this soon, it sounds so delicious! Looks absolutely delicious – perfect as a birthday cake! I made this and is delicious the only thing is that mine is not as yellow like the picture why??? Mine isn’t as yellow either,why? It’s all in the eggs you buy. If you use brown eggs that have not been processed, they are very orange looking which is much healthier. Which creates a yellow cake. 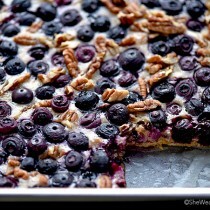 If I wanted to make a rectangular sheet cake, or layered sheet cake — would I double the recipe? This round cake serves 12, and I might have some 15-20 guests. Thanks for any help! Unfortunately, mine did not turn out yellow either and since I had a client who wanted yellow cake, I couldn’t use this recipe. ???? Great cake recipe. I actually used cake flour to make it lighter and it’s delicious. I also used a homemade chocolate buttercream frosting, not the malted. Great cake! I have been baking for years now but had never baked a yellow cake. I made this cake twice-once for Hubby’s bday and also for Thanksgiving. Although it was delicious and was devoured within 2 days each time, it was not moist. It was dry, compared to other homemade cakes I’ve made. Why did mine come out dry?